NEW YORK, New York, May 4, 2011 (ENS) – New York City has hailed the Nissan NV200 as its Taxi of Tomorrow competition winner, Mayor Mike Bloomberg announced Tuesday. The light commercial vehicle will be the city’s exclusive taxicab for the decade beginning in 2013. Mayor Bloomberg announced the Taxi of Tomorrow winner at City Hall with Nissan Americas Chairman Carlos Tavares, Taxi and Limousine Commissioner David Yassky, Ron Sherman, president of the Metropolitan Taxicab Board of Trade and other representatives of major taxi fleets and taxi owners. “The City’s Taxi of Tomorrow is the Nissan NV 200 – and it’s going to be the safest, most comfortable and most convenient cab the city has ever had,” said Mayor Bloomberg. The New York City Taxi and Limousine Commission chose the Nissan NV200 after a rigorous selection process over more than two years. The other two finalists included Ford Motor Co. and Karsan, a Turkish vehicle manufacturer. The city now will enter into final negotiations with Nissan to make the NV200 the first taxi specially built for use in New York City. “Never before in the 100-plus year history of the taxi industry has its combined strength been used to drive the design and creation of a purpose-built vehicle, tuned to the streets it will be driving on,” said Taxi and Limousine Commissioner David Yassky. “For the first time, we’ll have a taxicab that wasn’t ‘off the rack,’ but rather custom-tailored to create the best fit for the drivers, owners and passengers of our city,” said Yassky. “This is the heir apparent to the Checker, and people are going to fall in love with this taxi once they ride in it. As part of the regular turnover of the city’s 13,000 taxis, the current fleet on the road will be retired out of service within three to five years, depending on whether they are in-use part or full-time, and replaced by the Nissan NV200. The NV200 features more passenger room than any New York City taxi ever on the road and a smooth ride designed for passenger comfort, a transparent roof, charging stations for mobile devices, built-in GPS navigation, and a high fuel efficiency rating. While fuel efficiency was not used as a specific criterion for evaluation, the Nissan NV200 is powered by a 2.0 liter 4-cylinder engine, that Nissan says is engineered to enhance the emission performance and fuel efficiency of the taxi fleet. A low-annoyance horn with exterior lights that indicate when the vehicle is honking, will help reduce noise pollution on New York streets. 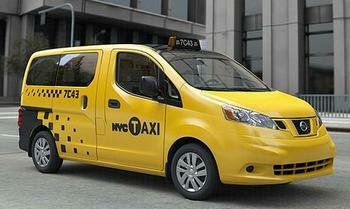 The Nissan NV200 taxi will be produced in North America at Nissan’s facility in Cuernavaca, Mexico. The taxi will be a modified version of the compact commercial vehicle currently available in global markets including Japan, Europe and China. As part of the program, Nissan also will work with New York City and taxi owners on a pilot program to study the use of zero-emission, electric vehicles as taxis. Nissan will provide up to six electric Nissan LEAFs to taxi owners for testing in 2012 as well as the charging stations to support their use. Nissan will be able to manufacture the NV200 to run on electric-only power starting in 2017. The city will begin adding Ford Transit Connect taxicabs to its fleet later this year. The Ford Transit Connect taxicab runs on compressed natural gas or liquid propane gas. “We are pleased that the Taxi and Limousine Commission has agreed to permit taxi owners to place interim vehicles like the Ford Transit Connect taxicab into service as early as next month, which helps our operators continue running purpose-built taxicabs,” said Sherman, who heads the Metropolitan Taxicab Board of Trade covering 33 taxi fleets and more than 3,500 yellow medallion taxicabs.